The Houseless Hills are proud to announce the launch of Bleake Rebellion. 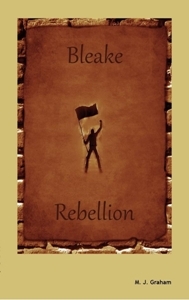 Bleake Rebellion is a captivating fantasy roleplaying game where you create a band of rebels seeking to overthrow the corrupt authorities that rule their beloved city. With its unique system for resolving challenges and building stories, Bleake Rebellion is the must have game for anyone who wants a fair, even-handed and emotionally fulfilling roleplaying experience. This book contains essential rules to get you started on your first story, advanced rules for when you have become an expert and a guide to life in the rebels’ city. For 3 to 6 players aged 16 or older. Bleake Rebellion is a low to medium crunch narrative game. When a player’s rebel tries to overcome an obstacle, the other players vote on whether they think that rebels success or failure is good for the story. To make their vote a player adds coloured beads to a bag and then the player who is roleplaying the rebel facing the challenge blindly draws some beads. The combination of beads he draws determines what happens next. It could be success or failure, and it could lead to a positive or negative outcome. Set in a pseudo-historical 18th century European city where some of the people are turned into magic wielding miscreations by an eldritch pollution called the miasma, the faithful can bring about miracles, and places of intense suffering become cursed, Bleake Rebellion explores the darkness within the hearts of rebels as they try to overthrown the tyrannical regime that rules their city. Bleake Rebellion is available at Lulu, Drivethru RPG and RPG Now. A quick update – Anyone who buys the book version from Lulu also receives the PDF version for free.